You can NEVER recreate a first impression. Never! And when that ever elusive first interview comes your way you better be ready to make the best impression possible. Needless to say, your first impression (leaving out your appearance which will be discussed in a later blog) begins with a smile, eye contact and then the handshake. That handshake is more important than you can possibly imagine for it speaks volumes about you. It reveals who you are, who you are capable of becoming and speaks to your level of confidence. Make no mistake about it, without a proper handshake you may as well kiss that job goodbye. In business (and securing a job is your business) a proper handshake is mandatory whether you have personal space issues or not. It’s expected. It’s more than simple courtesy; it’s mandatory whether you are a man or a woman. 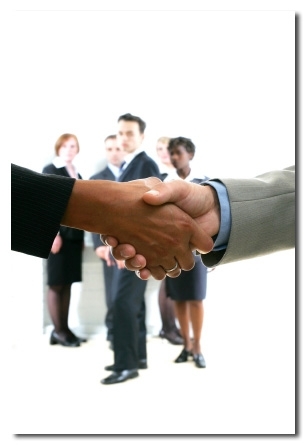 Business protocol requires you to extend a hand of greeting to your hiring authority, potential supervisor, to new clients or customers and to everyone in a group that you are introduced to in a business situation. Developing a good, firm, solid handshake is in essence required of you as it could very well be your foot in or out the door. As a recruiter, I’ve had my share of bad handshakes. Here are a few and what I was thinking at the time. Please, let’s forget the “ladies” handshake where they only extend their fingertips. That is so passé, it’s not 1940. It’s the 21st Century get with it honey! Who do you think you are anyway? How about the “I’ll jack that car up for you” handshake where your whole arm from the shoulder down is in motion from the force of the others pumping actions “you must be really, really happy to see me, how desperate are you anyway?”. And then there is the across the body from left to right handshake “what in heavens name are you doing to my arm and hand? Nothing you have to say from now on is even something I’d like to hear”? A handshake is like a dance between two people. All you have to do for a good professional handshake is to simply match their step. With your hand extended and thumb up you grasp their right hand matching your thumb web to theirs making a perfect fit of the hands. You close your fingers around their hand and try to match the strength of their grasp – not too hard, not too soft but firm. It’s a grasp not a squeeze. You’re holding their hand with yours. The actual shake is a gentle up and down if they don’t take the lead first. And after one or two motions you gently release your grip never loosing eye contact. Be the first to reach out and offer your hand for you are there by their invitation. Be courteous. The handshake is a sign of respect after all. After the interview, extend your hand again to thank them for seeing you. With a solid professional handshake, you might be able to demonstrate that you indeed are the right candidate for that job.